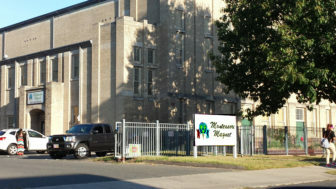 Montessori Magnet at Moylan School in Hartford, where all 3-year-old pre-kindergarten applicants won a seat. Below, you’ll find how many applicants from Hartford and surrounding suburban areas chose each school as a first choice and how many seats were offered for the 2017-18 school year. When a school offered more seats than it had applicants, that means students who did not choose the school as their first choice were offered seats. Many numbers are missing, mostly because of data suppression meant to protect student privacy by not releasing potentially identifying small numbers. Read the full story about the state’s integration efforts and the way the lottery works here. The raw data for this table and all of the work to prepare it is available in this Github repository. It includes the separate, scanned spreadsheets of offers and applications we received from state officials, as well as our process to turn those scanned documents into a proper spreadsheet. We encourage you to check our work and build upon it.